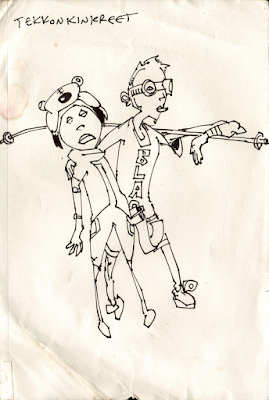 Here's my sketchy-style tribute to Tekkonkinkreet, most likely the best anime you can look at with your eyes. The animation style is unique and lively, as are the characters and everything else about the film. It's about a couple of street children fighting a batch of alien yakuza, and is told from the point of view of said urchins, psychoses and all. The trailer doesn't do it justice.